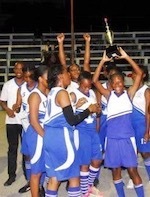 Fresh off their victory over Herbert Morrison Technical to secure a perfect season in the ISSA Western Conference Girls' Open basketball final at the Montego Bay Cricket Club last Thursday, Mt Alvernia High have set their sights on a national title next Wednesday in the ISSA National play-offs at Knox Community College in Manchester. Both teams will represent the Western Conference as they seek to add the national title to their accomplishments. Six schools - two from each of the three conferences - will participate in the one day play-offs with Mt Alvernia High playing in Zone Two against Central Conference runners- up Glenmuir High and Southern Conference runners- up Camperdown High. Herbert Morrison will be in Zone One against Central champions DeCarteret College and Southern winners Holy Childhood High. Last Thursday, Mt Alvernia High, led by a game high 27 points from Tiana Wilson, completed a perfect season by beating Herbert Morrison 53-46 in a close and exciting game. Fresh off their big 61-24 win over Muschett High in Montego Bay on Monday, red-hot Mt Alvernia High will be going after a sixth-straight victory in the ISSA Western Conference Girls Open basketball competition when they take on York Castle in a second-round game at Muschett High in Wakefield, Trelawny, today. In the second game of the double-header, William Knibb Memorial will seek to take over sole ownership of second place when they face Muschett High. William Knibb are seeking a third-straight win and fourth overall today after beating Muschett High 64-12 in the first round and holding off Herbert Morrison Technical 29-25 on Monday. Mt Alvernia ran their record to five-straight wins on Monday after an easy 37-point win over Muschett High at Cornwall College as they held the Trelawny school to single-digit scoring for the first three quarters. Mt Alvernia led 16-2, 38-6 and 48-13 after the first three quarters as Chrisana Thorpe led the way with 31 points and 17 rebounds as well as six steals, while Abigail Wright scored 12 points and Shanna-Kay Andrews scored four points and had 10 rebounds and six blocked shots. Moeeka Brown was the top scorer for Muschett High with 13 points and six rebounds, Keith-Ann Lawrence scored nine points, six rebounds and five steals, while Janiel Johnson scored two points and had 12 rebounds. In the first game, William Knibb led Herbert Morrison 21-8 in the third quarter before the Montego Bay school roared back only to fall short by four points, losing back-to-back games after winning their first three in a row. Samara Spence, who leads the competition in total points, assists and steals, was the top scorer in the game with 18 points, 10 rebounds and eight steals, and was assisted by Shania Wright's five points and 10 rebounds and Ashanti Hall's four points and nine rebounds. Kerry-Kay Stephenson was Herbert Morrison's top scorer with 11 points, while Meisha Reynolds scored 10 points and Danyce Murray had nine rebounds. Herbert Morrison Technical will go after a third-straight win in the ISSA Western Conference girls' open basketball competition today when they take on winless Muschett High in the second game of a double-header at Herbert Morrison. Herbert Morrison, who are returning to the competition after a long break, won their first two games to be on four points, two behind leaders Mt Alvernia High, who have won their first two games. In the first game, set to start at 1:30 pm, William Knibb will go after a second-straight win when they face first-timers York Castle High, who are still to win a game after two starts. On Friday, William Knibb Memorial rebounded from their opening loss to beat former champions Muschett High 64-12. After a double-digits loss to Mt Alvernia High, William Knibb rebounded with a strong display on Friday, led by triple-double efforts from Shania Wright and Samara Spence as well as a double-double from Ashanti Hall. William Knibb dominated from the start and led 14-6 after the first period, 29-8 at half-time and were up 41-10 at the end of the third quarter on their way to a big 52 points win. Wright scored 23 points, had 11 rebounds and 10 steals; Spence had 20 points, 12 steals, 10 rebounds and seven assists, while Hall scored 12 points and had 11 rebounds for the winners. 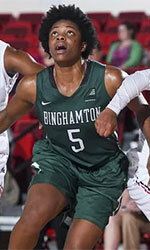 Moeka Brown scored eight points for Muschett, Shaday Shreves scored four points and Sanique Sinclair had 10 rebounds.